Samyukta Maharashtra Smriti Dalan is a beautifully crafted Memorial building, located at Shivaji Park besides Mayor House. It displays history of the movement which dates back in 1920 when Gandhiji passes a resolution to form state on linguistic basis which led to Samyukta Maharashtra Movement. The exhibition is spread on total three floors that is 1) Underground, 2) Ground floor and 3) first floor. The ground floor have information on origin and history related to Samyukt movement. 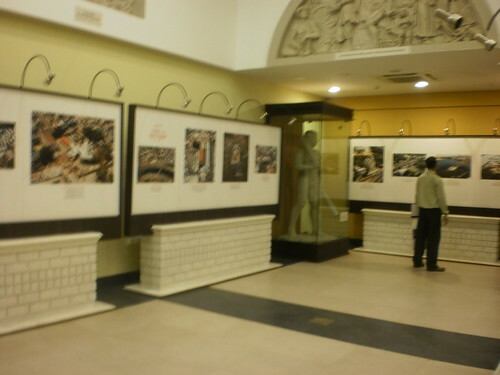 It has exhibited lots of rare photos relating to movement since 1915. The exhibition gives the glimpse of the intensity of the movement and leaves lasting impact on our minds. The underground floor exhibits the information of all the great leaders who fought this movement with lots of heart and vigour. One can see the priceless portrait paintings of main leaders of the movement such as Shripad Dange, Prabhodhankar Thakare, S.M. Joshi, Acharya Atre and Senapati Bapat. Samyukta Maharashtra Smriti Dalan is built by the initiative of political party Shiv Sena. It is the amazing work done in which not a single information has been left out of this historic movement. It is a must see Smriti Dalan for all the Mumbaikars, Maharashtrian and all Indians. Lets pay tribute by visiting it. Location: Near Mayor’s Bungalow, Shivaji Park.